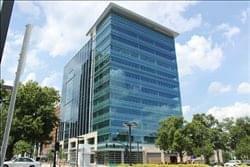 Find My Workspace lists over 95% of the executive office suites market in Raleigh. Simply click Request Quote to check pricing for one office, or Add to Basket for multiple offices. 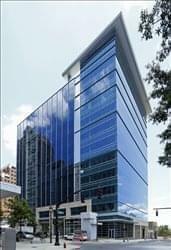 The center is located in the prestigious downtown Raleigh. The space offers private executive suites that are ideal for business professionals. All of the offices have window views and are furnished with desks, lamps, and chairs. Live answering receptionist services are included from 8.30 am until 5.00 pm EST. Also, two conference rooms are available for larger meetings with a maximum capacity of 12. Break room includes filtered water, microwave, full size refrigerator, and dishwasher. This center offers both private office space and collaborative space to cater for anything from start-ups to established companies. The space is located in state capitol, in Raleigh’s business hub. With on-site amenities such as an on-site cafe where you can get delicious pastries and great coffee, sun-lit common areas, huddle rooms and relaxation spaces for all members and floor-to-ceiling windows that give breathtaking views of the whole city. This work-space located in a prime location of Raleigh offers a 10-person boardroom table combined with 3 co-working stations. Situated inside of a boutique hotel you will find several amenities that are easily accessible. 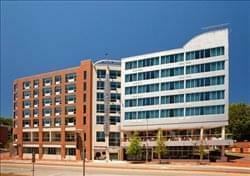 The hotel space has 24-hour access so is suitable for any working needs. Here, you can also make use of the several meeting rooms that are also on-site. The space also includes all of the essentials you need for a productive day, including free coffee, water, WiFi and more. This ultramodern, retail office community and corporate hub will inspire all prospective tenants and commercially minded residents with its creative workspace and exceptional range of professional provisions. Pairing a rich and inspiring historic design with fresh contemporary style and interiors in downtown Raleigh’s up-and-coming Warehouse District, this stunning and well equipped business center installation provides an innovative and highly exciting working environment. The services offered are tailored to suit you and your business, making this the ideal environemnt for any type of industrial purpose or client requirement.